Hawaii has 8 major islands, each with their own distinct landscapes and parks. 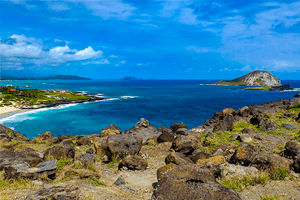 From volcanoes to waterfalls and beaches, the Aloha State has some of the most varied parks. 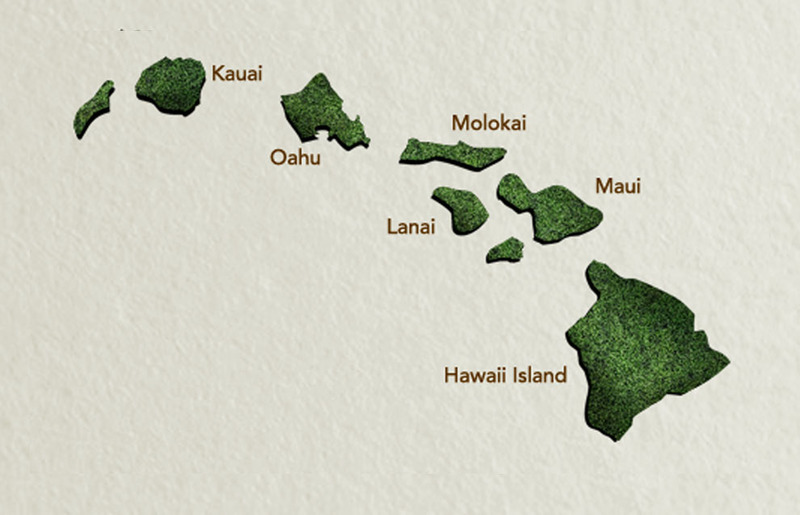 Explore each island for a breakdown of what awaits you in Hawaii. While visitors know Oahu for Honolulu, Waikiki and Pearl Harbor, it is also a haven of natural wonders. For those wanting more than typical attractions, there are recreational areas, parks, coastlines and historic heiaus to discover. Within Honolulu, visitors can explore Iolani Palace, the only royal palace in America, or hike the extinct volcanic crater Diamond Head. Moreover, there are also plenty of camping, trails and bike paths along the coast. For this and more about Oahu, check the link below. Maui is an adventurer’s paradise. Here, travelers can enjoy lush forests, explore caves or admire roadside waterfalls. While on the Hana highway, visitors can witness blow holes, lauhala forests and black sand beaches. You can learn about the Hawaiian way of growing taro at the fields in Wailua Valley State Wayside Park. In Iao Valley, you’ll view an ancient battle grounds, an iconic needle-like mountain peak and a botanical garden. 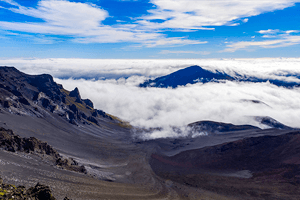 On Haleakala, travelers can venture into wilderness, go camping or hiking in volcanic crater for days at a time. For this and much more, check out the link below. The Garden Isle is famous for its beautiful foliage and greenery. While it only has relatively few parks, Kauai has some of the most spectacular. As you explore the island, you’ll experience, sea caves, staggering mountain hikes, coastlines trails and dense forests. Such places will include the iconic Na Pali coast and stunning Waimea Canyon. Kauai parks are dynamic and full of intrigue, drawing only the most daring of vacationers. This verdant island is ideal for active travelers who enjoy living life on the edge. So if you’re one of these people, you’ll need to find out more in the link below. The Big Island is home to one of the most famous national parks, Hawaii Volcanoes National Parks. Here, active volcanoes have devoured villages, overtaken highways and molded forests with lava flows. Molten magma still flows into the ocean, changing the island’s shape each day. While you are here, take the opportunity to hike over cinder cones, visit ancient ruins or view Rainbow Falls. Filled with historical significance and unparalleled landscapes, the Big Island has places you should not miss. So find out more in the link below. Renowned for its sea cliffs, waterfalls and wilderness, Molokai has some of the most exquisite forests and coasts. There are plentiful opportunities to go deep sea-fishing, camping, hunting and backpacking. 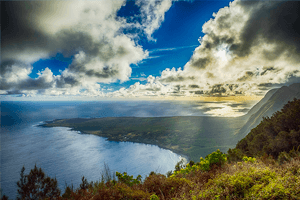 While Pala’au State Park and Kalaupapa National Historic Park are the only parks on Molokai, both are spectacular. Here, you can take the famous mule-ride journey down to the history-rich area below. The island possesses some of the most untainted and striking reserves in Hawaii. Find out more in the link below. While visitors know Oahu for Honolulu, Waikiki and Pearl Harbor, it is also a haven of natural wonders. For those wanting more than typical attractions, there are recreational areas, parks, coastlines and historic heiaus to discover. Within Honolulu, visitors can explore Iolani Palace, the only royal palace in America, or hike the extinct volcanic crater Diamond Head. Moreover, there are also plenty of camping, trails and bike paths along the coast. Maui is an adventurer’s paradise. Here, travelers can enjoy lush forests, explore caves or admire roadside waterfalls. While on the Hana highway, visitors can witness blow holes, lauhala forests and black sand beaches. You can learn about the Hawaiian way of growing taro at the fields in Wailua Valley State Wayside Park. In Iao Valley, you’ll view an ancient battle grounds, an iconic needle-like mountain peak and a botanical garden. On Haleakala, travelers can venture into wilderness, go camping or hiking in volcanic crater for days at a time. The Garden Isle is famous for its beautiful foliage and greenery. While it only has relatively few parks, Kauai has some of the most spectacular. As you explore the island, you’ll experience, sea caves, staggering mountain hikes, coastlines trails and dense forests. Such places will include the iconic Na Pali coast and stunning Waimea Canyon. 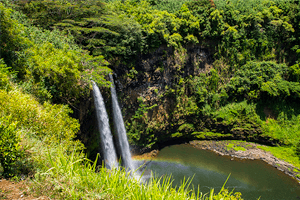 Kauai parks are dynamic and full of intrigue, drawing only the most daring of vacationers. This verdant island is ideal for active travelers who enjoy living life on the edge. The Big Island is home to one of the most famous national parks, Hawaii Volcanoes National Parks. Here, active volcanoes have devoured villages, overtaken highways and molded forests with lava flows. 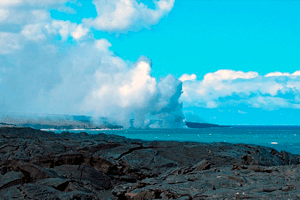 Molten magma still flows into the ocean, changing the island’s shape each day. While you are here, take the opportunity to hike over cinder cones, visit ancient ruins or view Rainbow Falls. Filled with historical significance and unparalleled landscapes, the Big Island has places you should not miss. It’s no mystery why many Hawaii parks are world famous. Tourists and visitors annually flock to the islands. Once doing so, they can view teeming marine life, waterfalls, canyons and rivers of lava. Hawaii hosts a total of 53 parks covering nearly 25,000 areas over five islands. Each island has numerous state parks. So no matter what island they visit, visitors can experience the parks’ splendor first hand.